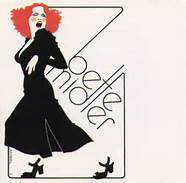 You know, I had two Bette Midler albums, this self-titled one and The Divine Miss M. The latter got leant to someone and never returned. Just desserts, I guess. And I remember who that was, and it wasn’t my brother. Anyway, why Bette Midler amongst my rock ‘n roll records, plus the one’s I inherited from the family collection? I like her. I like Bette Midler. I like her energy, her enjoyment in what she does, I like her talent. I’ve never seen her in concert, though I wouldn’t mind, and I don’t flock to her movies, but I like Beaches and The First Wives Club, and how fabulous was she in The Rose. I like Mayim Bialik, TV’s Blossom, who played the young Bette Midler in Beaches and is now wowing us as Amy Farrah Fowler on The Big Bang Theory, my favorite show. This album that salutes all eras of music, is appropriately, for workout purposes, peppy on side one, and a bit more laid back on side two. Bette Midler is a bawdy, ballsy broad, and does it well. This is just a lot of fun and has earned a spot on the Ram alternative list, behind Delaney and Bonnie and Layla, but up there with Benny Goodman. As a matter of fact, as I had to put away Bruce Springsteen’s “Santa Claus is Coming to Town,” it is after Christmas after all, I think Ms. Midler will stay out for a while as I can use her and side one for extra aerobics when needed. Really fun album. Really good workout. I’m now missing the other record.